At a star-studded gathering yesterday, New York Women in Film and Television honored five inspiring women with its annual Muse Award. Along with actors Mary-Louise Parker, Debi Mazar and Martha Plimpton, and Firelight Media founder Marcia Smith, Bloomberg Media’s COO Jacki Kelley was recognized for her visionary leadership. 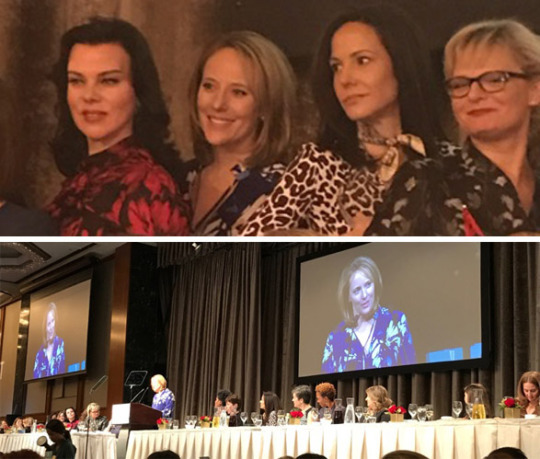 Above: NYWIFT Muse Award Winners included Debi Mazar, Jacki Kelley, Mary-Louise Parker and Martha Plimpton. Below: Bloomberg Media COO Jacki Kelley accepts her award at the NYWIFT gala. She has already amassed an impressive collection of awards and honors for her entrepreneurial leadership in advertising and media, and for being a powerful champion for diversity and inclusion. This fall, Kelley led an initiative to launch Big Problems. Big Thinkers, a new six-part television and video series examining some of the biggest threats facing humanity and the possible solutions underway to solve them. The series, created in partnership with journalist Terre Blair, features in-depth interviews with Warren Buffett, the Dalai Lama, Michael R. Bloomberg, Steven Soderbergh and more. “I would say we became like Thelma and Louise – except we were on the run to change the world for the better,” said Blair, in a Bloomberg News-style video shown at the NYWIFT gala. In the video, additional media luminaries including Bloomberg Chairman Peter Grauer, The Female Quotient CEO Shelley Zalis, Interpublic Group Chairman and CEO Michael Roth, and Bloomberg Media CEO Justin Smith also weighed in on what makes Kelley such an effective, inspirational leader. Hats off to Jacki Kelley! We couldn’t be more excited and proud.